In the years leading up to the 50th anniversary of Century 21, the Seattle World’s Fair, Seattle Landscape Architect Brooks Kolb was pleased to be invited to design a garden for an iconic modern house that was originally billed as “The Century 21 Idea House.” Located at the very top of the Inverness hill, this elegant house with pyramid skylights was originally designed by mid-century Seattle Architects Fred Bassetti and Jack Morse, who was a distinguished colleague of Brooks’ father, Keith Kolb, on the University of Washington architectural faculty. 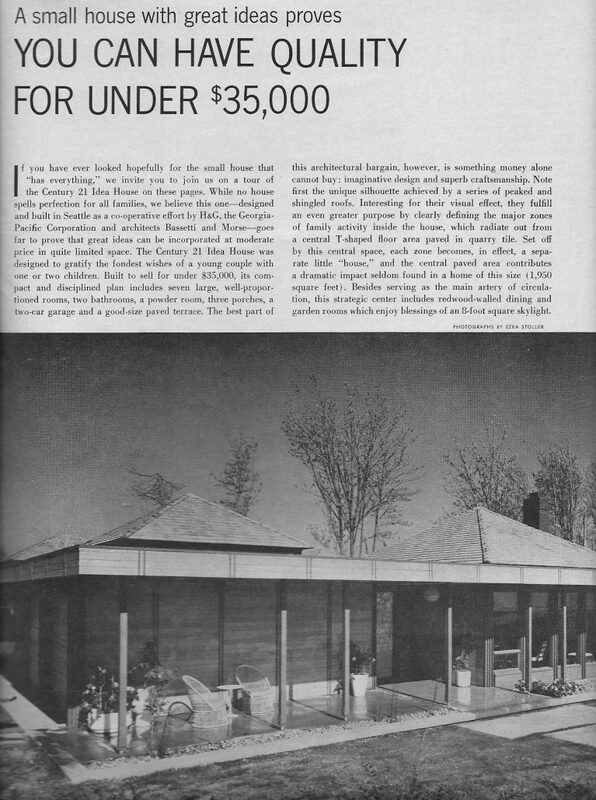 The 1962 project, marketed to fair-goers for its futuristic architectural expression, was a joint venture between the architects, Georgia-Pacific Corporation and House & Garden Magazine, in which it was originally published. 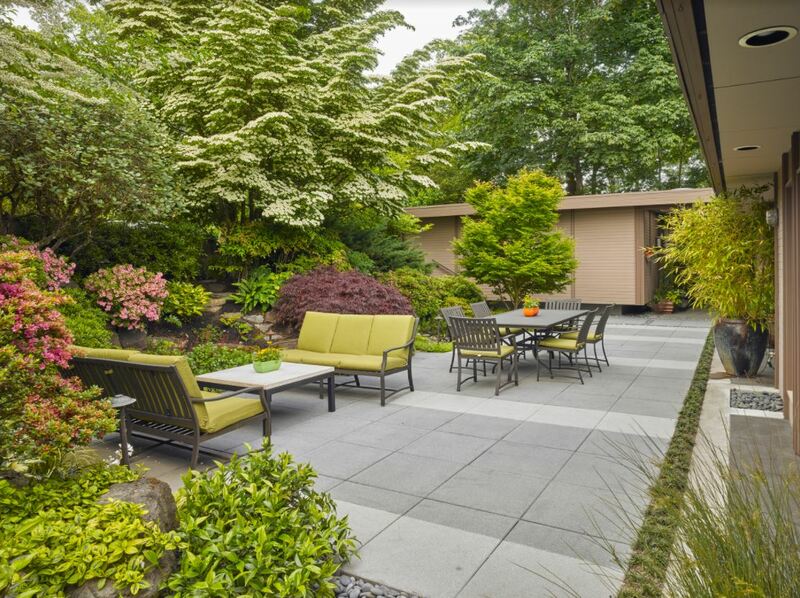 The new owners called Brooks in to create a new, private dining patio on the east side of the house. Brooks’ design approach carefully reflected the clean, horizontal lines and flat podium of the house: a narrow, elegant and perfectly level concrete band runs around three sides of the house, becoming a curb where the land drops away, and offset from the house wall with a band of river rock. 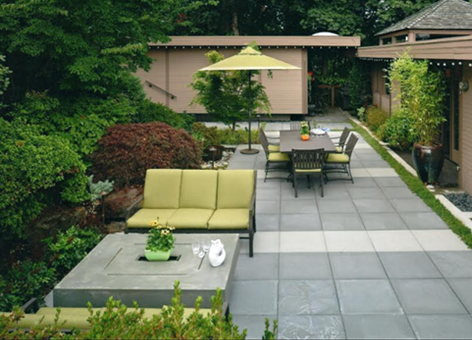 Brooks proposed a two-tone color scheme for the paving, using intermittent bands of natural Texada concrete pavers alternating with fields of charcoal Texada. 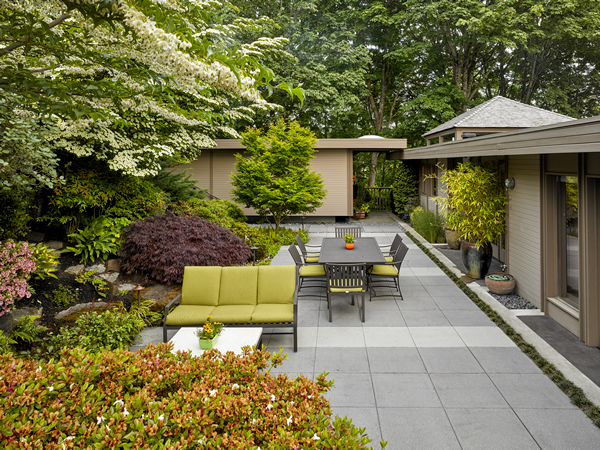 Brooks divided the space into an outdoor dining room and an outdoor living room. The latter features a fire table from Restoration Hardware which substitutes for a coffee table. 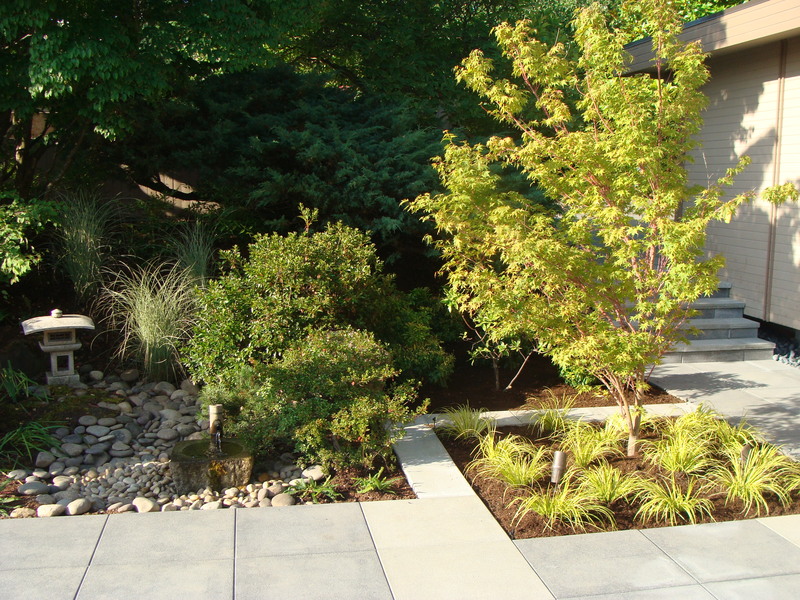 New plantings of Coral Bark Maple, Acorus grass and a flat band of Bluestar Creeper are deftly interwoven with a bank of pre-existing Japanese-style plantings that screen the private space from the street above. This project appeared in the Fall Home Design 2012 issue of the Seattle Times’ “Pacific NW” Magazine, on October 14, 2012, with a story by Becky Teagarden and photos by Ben Benschneider.